Currently, the buzzword in doing business in a foreign country is “International PEO.” A company that intends to bring their business to another country would most likely have heard or made use of Professional Employer Organizations, or simply PEOs. PEOs are modern and highly convenient means of doing business overseas. 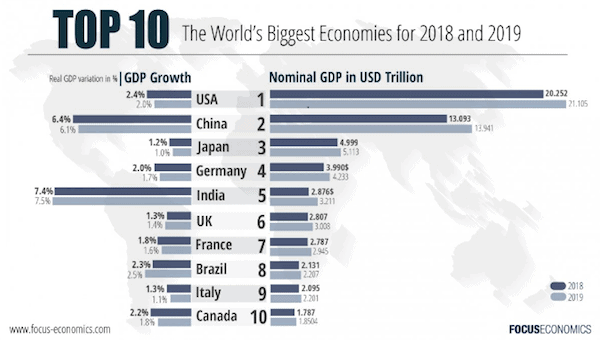 As shown in Figure 1, China is the second biggest economy in the world. This is why many companies are quite interested in doing business in the country. However, the harsh reality is that this is easier said than done. Doing business in China is far from simple and involves numerous legal challenges. PEO is the solution to this problem. Through PEOs, doing business in China is easier, less risky and more cost-effective. A company that thinks it can do it on its own in China without getting help is mistaken. Foreign investment in the country has been under the regulation of the Catalogue of Industries for Guiding Foreign Investment (Catalogue) since 1995. This is updated every three years in accordance with China’s prevailing political and economic goals. To comply with the provisions of the Catalogue is crucial. Encouraged – includes 348 industries, eg production of food and vegetable drink, software products development and manufacture, and manufacture of agricultural machinery. Restricted – this means that industries under this category are subject to certain limitations. It currently includes 35 industries, eg exploration and exploitation of graphite, airport and power grid construction and operation, general aviation companies, railway passenger transportation, banks, securities, and insurance companies. Prohibited – At least 28 industries are not open to foreign investors in China, eg social survey, Manufacturing of weapons and ammunition, and wholesale and retail of cigarette and any other tobacco products. Permitted – industries not included in the first three categories are normally permitted in China. A complete list of all the industries that fall under each category can be found in the latest version of the Catalogue. Starting 3 October 2016, some of these industries have been included under the Negative List. To be allowed to do business in industries under the negative list, the investor must first acquire the approval of the Ministry of Commerce. While there are other forms of entities, eg partnership enterprises, and trusts, the foregoing are the most popular among foreign investors and entrepreneurs. The wholly foreign-owned enterprises (WFOEs) are the most common form of Foreign Invested Enterprise (FIE) in China. A company is considered an FIE if 25% to 100% of it is controlled by foreign investors. As the name suggests, WFOEs are 100% foreign-owned. WFOEs come in different types, the most popular of which are Limited Liability Companies (LLCs). The attractiveness of forming a WFOE in China lies in the different rights that come with it. Fundamentally, foreigners who own WFOEs in the country share nearly identical rights as any Chinese business owner. Moreover, with an LLC, owners are not held personally liable and partners are just responsible for their own investment. WFOEs may also operate as a retail store or a trading company by virtue of China’s membership with the World Trade Organization (WTO). The process and procedures for registration and approval could take a couple of months to complete, ideally. Moreover, there will be a required minimum capital but only for companies operating in regulated sectors. Otherwise, there is no registered capital maximum limit on WFOEs. Finally, WFOEs are required to submit to an annual reporting of their financial books to concerned government agencies. The previous practice was a yearly inspection of government agencies of the financial books of companies. With the revision of the PRC Company Law in 2014, the reporting system superseded the inspection system. The second most popular business entity used by foreign investors in China is the joint venture. Given that foreigners have Chinese partners in JVs, the restrictions are lesser and certain industries which are not allowed to foreigners may be formed. Moreover, given that a local partner also owns the business, he can serve as a huge help in forming and running the business. He would be able to know the best approach to challenges and serve as a medium for such issues as language barriers. However, just as there are benefits, the risks involved in JVs can prove detrimental. With a Chinese partner who also has control in the business, there is also the possibility of differences that could adversely affect the business or the partner pushing the foreign investor out. While there is intellectual property (IP) laws in the country, these are rendered lax and could, therefore, result in the loss of the brand, or exposure or copying of trade secrets by the Chinese counterpart. Experiences divulged by successful JVs in China showed that success can be attributed to the constant monitoring of what happens in the JV on a regular basis. Relying on the Chinese partner to run the company given that he knows China, will simply not work. The success of the management, marketing, finance, operation and other business processes remains to be in the hand of the foreign counterpart. If the foreign investor does not have the time, energy and money to do this, it is not wise to form a JV. A Representative Office (RO), also called a Liaison Office, serves as a separate legal entity which represents an existing foreign company in China, referred to as Hongda. Compared to the WFOEs and JVs, ROs are easier to open and less costly. However, given the operational limitations imposed on ROs, this may not be a viable option depending on the purpose of the business entity. Figure 2 summarizes the pros and cons of ROs. ROs are only allowed to conduct research and marketing activities, thus are commonly not recommended. Despite its inability to generate profit or collect payments, ROs could be subjected to taxation depending on certain factors, eg location, business plan, etc. Moreover, it has a short lifespan given its limited range of operation, normally about two years. Also, a rented office space must be established prior to starting the RO. Since one of the advantages of creating an RO is China is to study the market, a disadvantage will arise when it comes time to change the RO into a WFOE. Many ROs may find the Chinese market conducive to their business. However, to be able to turn the entity into one that can operate such business, the RO must first be shut down. Only then will the foreign company be able to start the entire process of registering the WFOE. The entire process can be completed between 6 to 18 months. 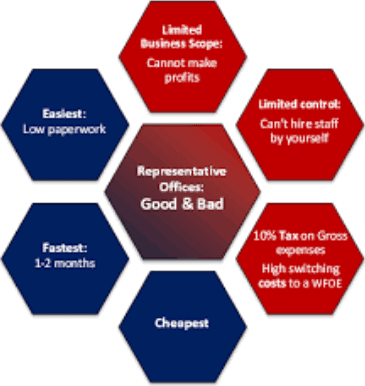 The formation of a sales office (SO) through labor dispatch in China is the easiest and less costly means of doing business in the country, particularly if there is a lack of a legal business entity. Through Order No. 22 of the Ministry of Human Resources and Social Security (MOHRSS) of China, which was enforced 1 March 2014, the use of dispatch labor became easier and more achievable. 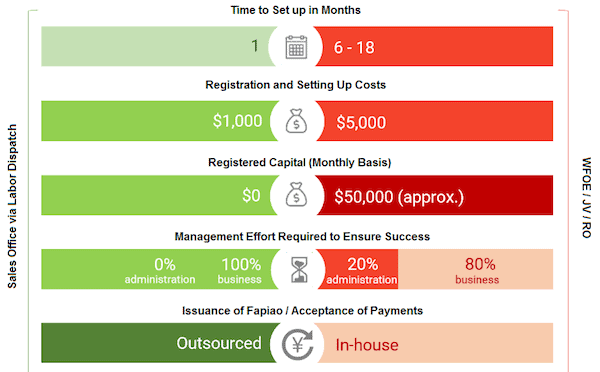 The SO via dispatch labor business model involves the outsourcing of the administrative and legal management of the representative office of the foreign company to a PEO located in China. In layman’s terms, a Professional Employment Organization (PEO) can be likened to a ready-made HR department that a foreign company effectively rents or hires to allow for the swift expansion of business in an overseas country, in this case, China. A PEO offers any foreign company with intentions to expand globally with the convenience of turning into its subsidiary in China, instead of having to go through the rigorous process and legal challenges of forming a legal entity in China. It negates the delays, costs, and intricacies involved in forming a business structure, eg WFOE, RO or JV. The foreign company may simply concentrate on how to market and strategize the business, with the administration portion left to the PEO. No direct relationship between the main company and the employees at the PEO exists. Therefore distractions and issues on the approval to operate are likewise negated. There is a saying that “locals know best.” This can very well apply to the use of PEOs in China. The process will be greatly eased by the hiring of a PEO that will serve as the foreign company’s local counterpart. It can even help in the immigration process required, as may be needed by the foreign company. The PEO will be in charge of hiring the foreign company’s employees in China. It, therefore, becomes the “employer of record” for tax issues, mandatory benefits, and insurance. This type of service is referred to as co-employment or joint employment. PEOs will not just make the launch of the business easier but more importantly, it minimizes the legal risks and delays that come with hiring employees. This is because the foreign enterprise need not have a direct employment relationship with the local employees but instead contracts the PEO. The latter, in turn, deals directly with the employees and makes use of the management fees paid to them by the client foreign company to pay the salaries of the employees. The employees will do the work required by the foreign company in China. While there are several benefits as to the use of SOs through labor dispatch in China, there are also disadvantages. Firstly, SOs come with limitations. Moreover, payment processes and Fapiao issuances are to be conducted by local payment/invoicing partners. Finally, the funds of the company which is in China will be administered by the administrative partner of the dispatched employee. This means that all benefits and funds will be sent directly to China. Given the foregoing salient information about each and every legal entity that can be formed in China, it is now up to the foreign company which type of business vehicle to choose. What should be considered first and foremost are the needs and objectives of the company. Those that prefer to penetrate the Chinese market in a quick and cost-effective means may greatly benefit from a Sales Office via labor dispatch. A PEO can provide insurmountable advantages. Figure 3 could help in deciding by providing the distinctions between a SO and WFOE/JV/RO. PEO’s allow for a flexible and less costly means of doing business in China. One good thing about it is that they now proliferate and are readily available. However, evaluating PEO’s remotely can prove difficult since they are not created equal. As such, finding a trustworthy and capable partner PEO is critical. New Horizons Global Partners assist foreign companies in starting its operations in China by offering tailor-made services for an optimal market entry or expansion plan.